So this is most likely true, but labeling it as rumor until it's confirmed. The full-on source of this does need to be verified. Apparently a private job description was leaked. On site work period (planned) 4/10 / Monday to 10/31 (Tue) until weekday 5 Working day, Saturdays, Sundays and public holidays! There is a possibility, but I think it is almost there. 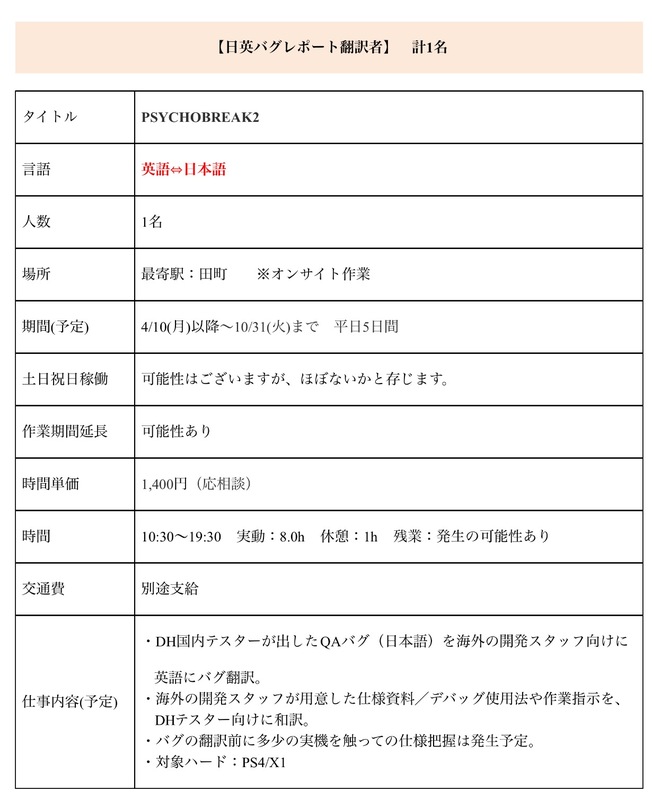 It's for positions of translating and Q&A bug reporting for Psycho Break 2, aka Evil Within 2. It being in production wouldn't be too surprising, Bethesda seems to list it as one of their big IPs and Tango Gameworks have said they wanted Evil Within to be a franchise, not a single game. It did well enough, holding the spot of top selling new horror IP until Dying Light a couple months later (though trumping the previous holder, Dead Space). And they've been working on their new game for at least the last couple years. Though going by job listings from a year or two ago, if this is related to those then there are some interesting things that may be at play here. They were looking specifically for people familiar with the Unreal engine and with experience in multiplayer fields, though if that'd be for TEW2 or something else is unknown of course. Regardless, Tango Gameworks newest title has a high chance of being revealed this year as it's been in production for about two years now. If The Evil Within 2 / Psycho Break 2 was what they were working on, what would you want from a sequel? Last edited by icycalm on 12 Jun 2017 06:11, edited 2 times in total. Friday the 13th, October 2017. Development on The Evil Within 2 started when work on the last DLC of The Evil Within finished, around the summer of 2015. This time they decided to go with a wider starting stage that not only includes missions but all kinds of different ways to play. There’s an element that will let you freely play at your own pace. In addition to playing stealthy, players will get to play any way they like, and it won’t be like the previous game that decided on your play style for each chapter. The game will have skill unlocks, as well as a crafting system that allows you to create weapons and ammunition using gathered materials. The theme isn’t to increase horror elements this time around, but to come up with a more enthralling story using the setting of the previous title. On the subject of horror, the focus is more on expressing a purse sense of fear rather than the grotesque. The story is truly great. Especially the latter half, so it’d be a waste to have players drop it due to its difficulty. The Evil Within 2’s story is connected to the previous game, so there will be something to provide info for those who haven’t played The Evil Within. There are three difficulties of “Casual,” “Survival,” and “Nightmare.” Those who enjoyed the difficulty will enjoy Nightmare mode. Shinji Mikami recommends Casual mode. Since The Evil Within 2 won’t be split into many chapters, there won’t be many loading screens.